Many plants in our landscape attract butterflies. 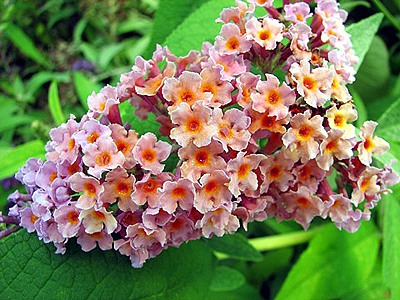 Here we are going to explore Buddleja davidii, otherwise known as Butterfly Bush. 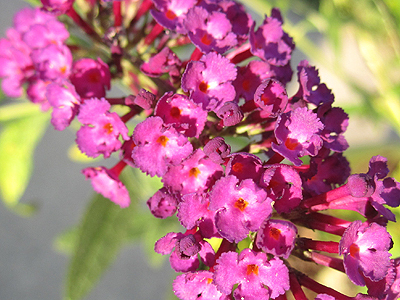 There are over 100 species of Buddleja. A few of them are considered trees. Some are evergreen and some are deciduous. 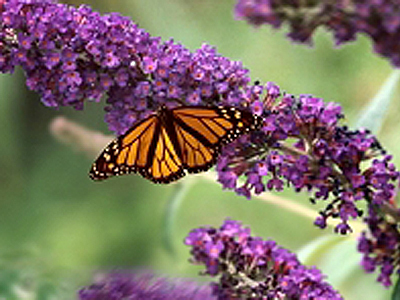 Butterfly bush is one of the most attractive plants to butterflies. Hummingbirds also enjoy their nectar. The white varieties may be the most attractive of all. This bush is native to northwestern China and Japan. It is a very stately weeping shrub that can attain 6 to 12 feet in height, with a spread of equal width. It has gray-green leaves on long arching stems. The tiny flowers are irresistible to butterflies. The blooms are long cone shaped clusters, 8-18 inches, that droop in a profusion of colors. The flower clusters can be so heavy that they cause the branches to bow even more. Some of the varieties are very fragrant. Flower colors may be purple, white, pink or red, all usually with an orange throat in the center. Butterfly bushes like a very well drained soil. In outdoor landscape they prefer it on the dry side after they have become established. In pots you must be careful not to over water them. In our rainy season it is best to cut them way back and remove the saucers from the bottom of the pots. They may be cut back to the ground, and will re-emerge from the roots. It is best to cut back the shrubs in any case, since the flowers are usually larger and more prolific on new growth. 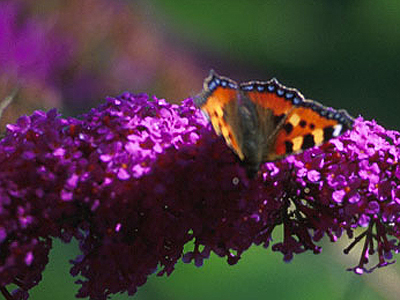 Buddleja will attract Anise Swallowtail, Comma, Black Swallowtail and Giant Swallowtail and Monarch. Sunflower brings Gorgone and Checker spot. Zinnia and Cosmos attract Cloudless. Sulphur. Of course they can not attract if the butterflies are not present. 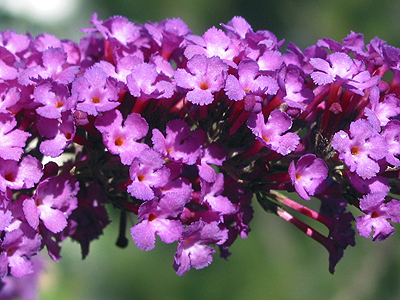 With Butterfly Bush you will get lots of action, and then you can research the names of your visitors. Growing plants is very satisfying in itself, but with the added plus of attracting these dancing aerialists, it is even more of a reward from your garden. Take a trip out to the Botanical Gardens of Puerto Vallarta. On your way down to the main building on the right just past the grotto, you will see a butterfly path. Bob has planted many of the plants and shrubs that attract butterflies. On my last visit the bushes were alive with butterflies. Bob also has a display of butterflies in the rest area; not all are from this area but all are absolutely beautiful and colorful. In the gift shop you can get a butterfly net for a closer look.